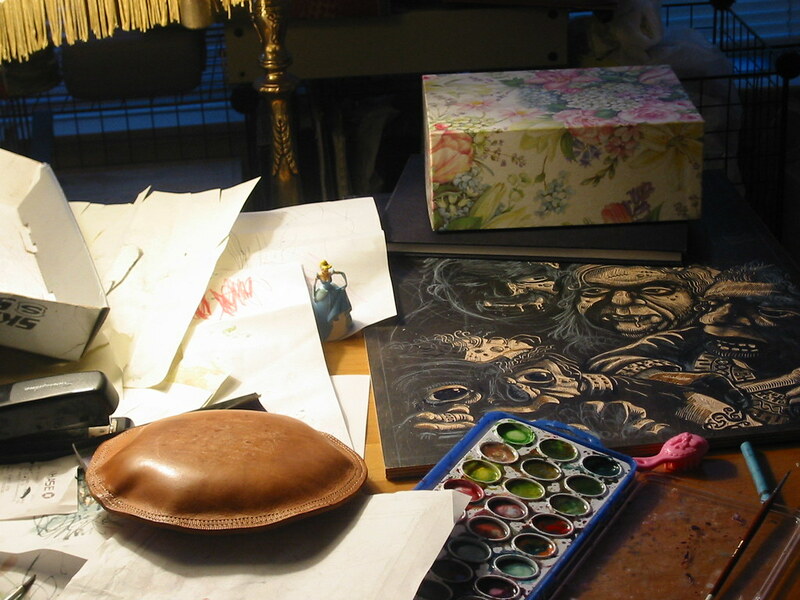 Here are some pictures of my workspace from about 2000-2007, which was just a corner in my apartment. I work primarily as a woodcut printmaker. Of all the printmaking processes, woodcuts (relief prints in wood) are perhaps the least toxic. This means I can get away with doing my work in the confined space of an apartment. The process also requires very little in terms of equipment. A knife, wood, paper, an ink roller and ink are the only supplies one needs. This is about the extent of my studio space. Because I can't get too sloppy, I don't really have a place to print my blocks, I usually move to my kitchen for that. What's missing from this view is the TV and Stereo which are usually on while I work. Despite the photographic chairoscuro of this scan, desk is usally very well lit. Like many woodcutters/engravers, I have have a whole bunch of tools for cutting, yet, I seem to revert to the same couple of tools (seen on the lower middle) all the time. Here is my current series of woodcuts in progress. The two on the bottom which are completely black are the ones that I have already printed. These days Nova's drawing and painting supplies have taken over my space. You can see a hint of the print I am currently working on (when I have the time and energy to do art).